Both controls are located in the Telerik.Windows.Controls.GridView namespace of the Telerik.Windows.Controls.GridView assembly. When working in Expression Blend, the namespaces that are needed will be added automatically. The Template Structure of the controls is also available here. The filtering dropdown icon can be styled by creating an appropriate style targeting the FilteringDropDown element. 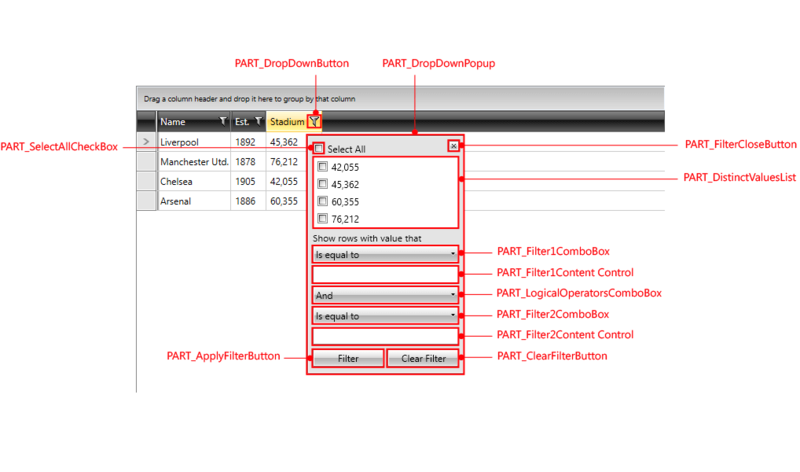 To learn how to modify the default FilteringDropDown style, please refer to the Modifying Default Styles article. 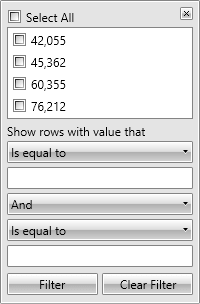 GridViewColumn exposes the FilteringControlStyle property of type Style. It is applied to the FilteringControl of the column. You can find the Template Structure of the FilteringControl here. You are also free to create your own Custom Filtering Control and craft it as you like.